A man waves a Pa’oh national flag as a hot-air balloon takes off. Fireworks attached to its base shoot down onto spectators, showering them with fire and flames. This amazing display was just one of hundreds during the week of the Tazaungdaing Festival of Lights in northeastern Myanmar’s Shan State. 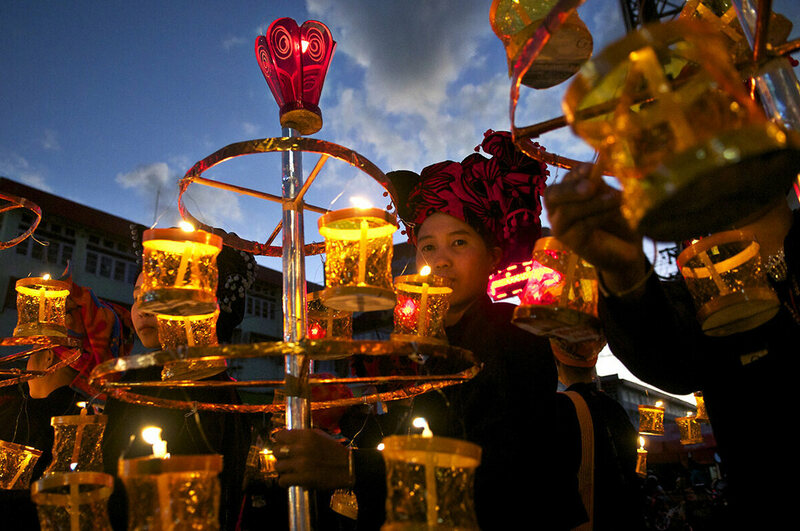 Held every year in November on the week of a full moon at the end of the rainy season, the festival attracts thousands to Taunggyi city. The beautiful—and dangerous—event is held next to fair grounds that feature hundreds of food stalls, games and local liquor promoters as well as a carnival that appears to be entirely powered by youngsters swinging on Ferris wheels or pushing pirate ships to create momentum. Last year, a balloon lift-off that went awry left two dead and injured 14. Firemen are on standby in case any of the hot-air balloons come crashing down with spiraling fireworks. The Tazaungdaing Festival of Lights may be beautiful, but it can also be dangerous, resulting in burns and welts when fireworks shower upon spectators. Working months in advance to create these massive hot-air balloons, local teams also experiment with explosives to create the colorful fireworks that are attached to the balloon’s undercarriage. The experimentation is often ad hoc, done with few safety precautions, and can sometimes lead to fatalities. But the people making the balloons are rarely persuaded to leave the craft. The Festival lasts for a week. Team members hold candles for a hot-air balloon. Ko Moe is part of a team of roughly 200 men who make the balloons each year. This year, the team, called Royal Kyar Nyo, made three hot-air balloons and entered them all into the Tazaungdaing competition. Ye Lin, 26, said that their first entry ended in great disappointment: While the fireworks planning and display went off without a hitch as the structure gained altitude, the wind changed abruptly at the last moment, causing the paper that the balloon was made out of to catch fire. Ahead of a hot-air balloon’s launch, team members prepare for it by attaching candle holders to its end. Team members work together to manually set a balloon afloat during the Tazaungdaing Festival of Lights, held in November 2015 in Myanmar’s Shan State. But the Royal Kyar Nyo team had high hopes for the second-to-last night of the festival, where they would launch their final creation—a sunflower-yellow hot-air balloon with a happy purple Buddha painted on it. Hours before lift-off, four men sat in a dark, musty room working quietly to prepare mini “rocket launchers” which would glide through the air and explode into fireworks when sparked. Buddhism, the pre-dominant religion in Myanmar, shows up often in the hot-air balloon designs during the week-long competition, such as this Buddha-like drawing. To an untrained eye, the men looked like they were working with a variety of colored powders and metal bits, stuffing the powder with their bare hands into small paper structures. The powder included potassium chlorate—an explosive that “adds strength” to the fireworks, though it is more typically used to make bombs. Some feature potassium nitrate, which causes the fire to burn green, while scandium nitrate produces red sparks, and magnesium mined from airplane bits, is generally used to make flames burn hotter and brighter. A hot-air balloon floats gently up into the night sky carrying a tail embellished with a design created using candle holders. This type of balloon while beautiful, is not as popular as the ones that hold home-made fireworks at its base. While the health ramifications of working on these explosives are unclear—Ye Lin said that the team wears face masks to protect themselves, but not much else—the balloon makers’ dedication to their craft appears to be all-encompassing. Members allocate their time, money, and resources to the process—which can cost up to $4,000 for a single hot-air balloon—despite all the potentially fatal setbacks. Team members work together to manually set a balloon afloat. A hot-air balloon with a design featuring the famed temples of Bagan float up into the night sky. He added that his older brother used to be part of a team but was involved in an accident that left him wounded. “He can’t really walk now because his waist and hand are injured and he also can’t carry heavy things,” Ye Lin said, adding that his brother still attends the festival every year.